The two hammers indicate a workday, which in Italy is classified as Monday thru Saturday. 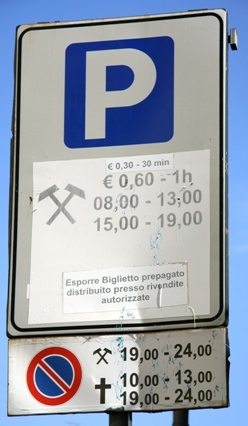 So, on workdays, you must pay to park from 8.00 -13.00 and from 15.00-19.00. This assumes that everyone is home eating a big lunch, apparently having worked up an appetite hammering all morning. And for those unfortunate souls who have nowhere to go for a home-cooked meal, at least you can park for free during lunch. The cross indicates Sundays and holidays, which do not have to be religious. This means that all time off is sacred. 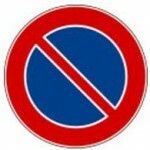 This sign means that it is forbidden to park on one side of the street, in this case, during specified hours. But now comes the tricky part: “Esporre biglietto prepagato distribuito presso revendite autorizzate” states the sign. Allora? Well then, let’s assume that after riffling through your phrase book, and arguing with your traveling partner, you have deciphered the meaning: “Display the prepaid ticket distributed by authorized vendors.” Well, you think, just who is an authorized vendor and where do I find one? Your next thought may well be to simply give up and drive away. Forza, you can do this! If you can’t decipher a sign or figure out where to buy a ticket, and there is no official traffic cop in sight, then head to the nearest café. Wave your arms around, babble in any language, and look desperate – this should be easy to do. There are always retired fellows that hang out in their favorite bar, and will be eager to help. In fact, once you have made it known that you are in need of assistance, they will instantly become your guardians and may eventually be hard to get rid of. You officially become a ward of the bar until you leave town. Once you finally get your parking card, it will usually look like a scratch and win lottery card, except there are no prizes. Scratch off the date and time of your arrival – give yourself an extra 10 minutes for all that effort – and run back to your car or you may get a parking ticket in the meantime. If you do, return to the bar and get your guardian to intervene on your behalf. 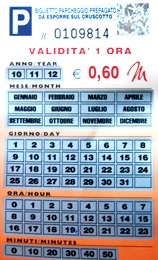 Place the card on the dashboard – cruscotto – so that it can easily be seen by the vigili. They are traffic cops and meter readers, that living up to their name, are ever vigilant. By now, it is probably lunch time, when you could have parked for free. Relax and have a good meal. Buon appetito! Grazie mille, very very very useful! Well, I never thought that I would be laughing out loud reading an article about parking regulations! I have seen these signs many times in Italy and never understood what the red sign meant. Thank you very much for this explanation. Hilarious- but also useful as we are in Italy and driving!! Thanks for the useful tips! Bookmarked for my July trip. Thanks! Just remember, Bruce, that blue lines on parking spaces mean you pay, at least during certain hours, yellow lines are for residents or authorized vehicles (don’t park there!) and the coveted white lines indicate free spaces. Have a great trip!